America, always revered as the land of opportunity, is rich in stories about ambitious, determined individuals who worked hard and built businesses of their own. Yet, few people know about the many African American entrepreneurs who helped shape the American dream. This collection brings their stories to life. In every century, succeeding in business has required courage, ideas, the willingness to take risks, and the desire to succeed. For an African American man or woman, building a business also meant struggling against prejudice and working even harder than many others. Those who succeed are not just good businessmen and -women, they are heroes and heroines. 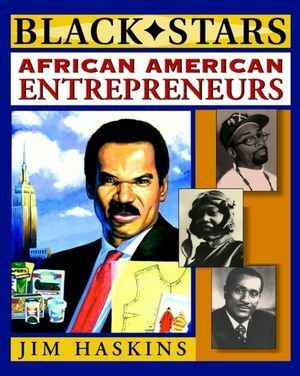 In this vivid, inspiring collection, you will meet more than thirty fascinating African American entrepreneurs, from the eighteenth century up to the present, who overcame the odds against them. You'll discover little-known facts about their families, and the exciting times in which they lived. Along the way, you'll witness the triumph of talent, ingenuity, and perseverance. * Marie-Therese Metoyer, born into slavery, started her own plantation. * Pierre Toussaint, born a slave in Haiti, became rich as a hairdresser in New York. * Granville T. Woods, an engineer, could not find work after the Civil War because he was black. So he started inventing. During his life, he registered more than sixty patents. * Henry G. Parks, using an old Virginia sausage recipe, built a national food company. * Alphonse "Buddy" Fletcher Jr., one of Wall Street's most successful stock traders, started his own firm before he was even thirty years old. This outstanding collection brings to light these and dozens of other exciting and surprising tales of entrepreneurs who lived their dreams. JIM HASKINS has written more than ninety books for young readers, including Diary of a Harlem School Teacher; his collaboration with Rosa Parks on her autobiography, Rosa Parks: My Story; and Black Eagles: African Americans in Aviation. He is Professor of English at the University of Florida, Gainesville, and winner of numerous awards, including the Washington Post Children's Book Guild Award for the body of his work and the Coretta Scott King Book Award.